Best described as a unique hotel. Why unique? Well it's part owned by Hollywood actor John Malkovich, is built from a 1960's office block and has possibly the coolest reputation in Cardiff. The rooms are light and airy with great views across the city. The furniture is modern and minimalistic and will appeal to any style-conscious traveller. The best bit about the BIG Sleep hotel is that it's a budget hotel so you get great rooms (and service) at a great price! 81 rooms with en-suite bathrooms. Bar facilities with after hours drinks available. 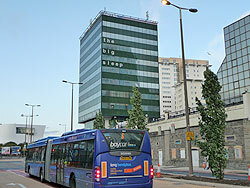 Situated alongside the Cardiff International Arena (CIA). Recently voted 1 of 25 coolest hotels in the world - Conde Nast Traveller. Conference room comfortably holds two to forty guests.